The recipe? 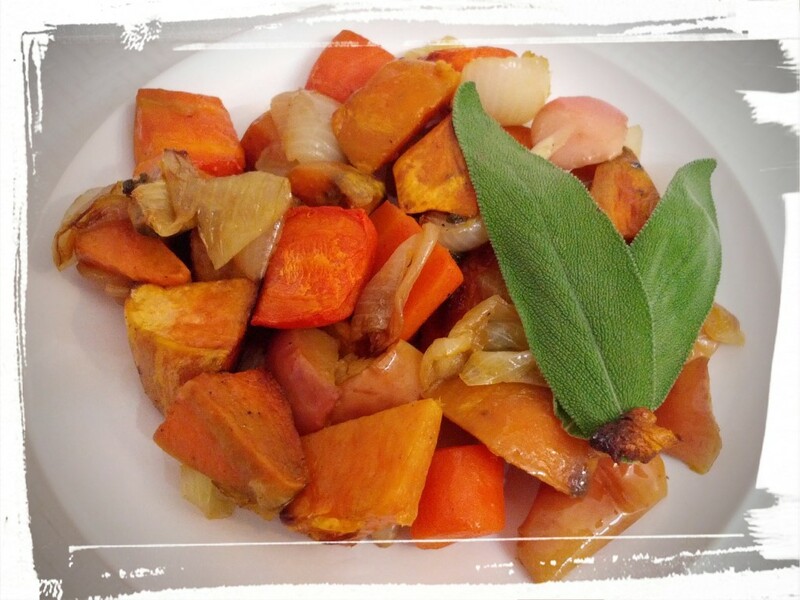 Roasted Sweet Potato and Apple with Pearl Onions and Crispy Sage. Except that I substituted regular onions for pearl onions, added in carrots, and changed the quantities of veggies. Because of course I did. Frying me up a mess of onions. I chopped, I pan-fried, I tossed, I roasted. And waited. And roasted some more. And then I turn on the broil function and sat in front of the oven on a wooden bar stool, watching the veggies to make sure they didn’t catch fire. I like my veggies and I did NOT want them going up in flames! I’m sure you’re wondering now why on earth they would. Well…did I ever tell you the story about my accidental Brownies Flambe? It came up at a dinner party that my sister and I were at recently and apparently it made quite an impression. And here I thought I was the only one with the image seared into my memory. Anyway, one time I’ll write a whole post about kitchen disasters. You’ll laugh, you’ll cry, you’ll walk away feeling better about yourself. Or at least your cooking ability. Speaking of which, I do not understand how the people who wrote the glowing reviews for this recipe did not have moments of self-doubt. How on earth did their recipe turn out? Or are they just saying that it did, because it sounds so easy and really, who could mess up the whole toss-veggies-with-oil-and-roast thing? *cough*QueenOfSubstitutions*cough*) Are they just saving face? I don’t think so. So what did I do wrong? Maybe I didn’t chop up the carrots and sweet potatoes into small enough chunks? Hmm. Let me go and review the recipe picture again. Hmm. I think that’s the only possible explanation. But…still. I really don’t think it’s realistic to cook sweet potatoes for an unspecified amount of time (long enough to quick-fry onions and crisp sage) and then add in an additional 10-15 minutes cooking, and have them be cooked through. That’s like maaaybe 30 minutes in the oven. 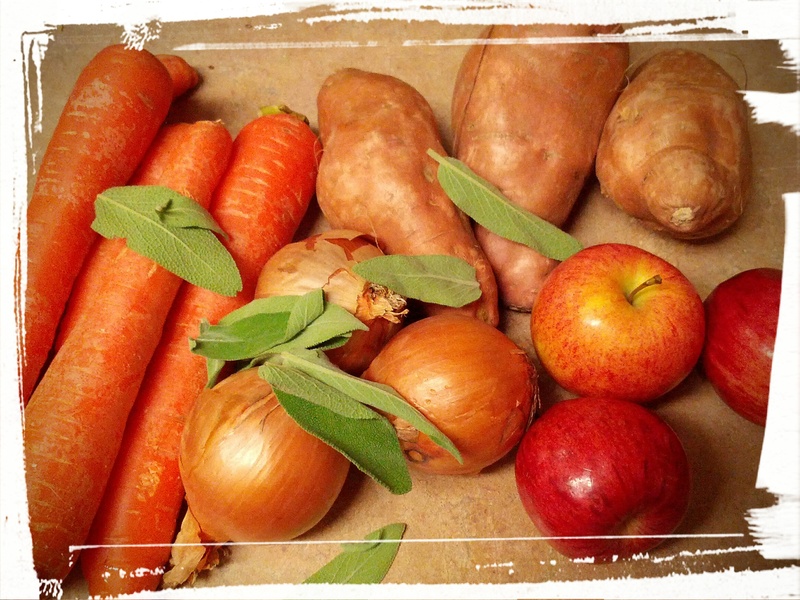 Even if I chopped the sweet potatoes into cubes half the size of a pearl onion…well, I guess it depends on the size of the pearl onion. Still Life in Harvest. Sans pearl onions. Verdict: the recipe should have specified that the sweet potatoes should have been cubed into teeny, tiny pieces. Regardless, once I’d made my adjustments to the quantities, and roasted the heck out of the veggies, it did turn out yummy. I might double the sage next time (I still have a bunch left from this recipe), and maybe figure out another herb to add (I’m thinking thyme), but generally, yum! I would never have thought to add in apples. I’ve packed some for the DH and I for lunches. I hope he likes it too! Here’s a question: how do you roast your veggies? I LOVE LOVE LOVE roasted veggies, but have yet to find a recipe that I heart as much. Any suggestions? Let me know in the comments! Next Post: Up with Quinoa. And carrots. And what’s the deal with rutabaga? 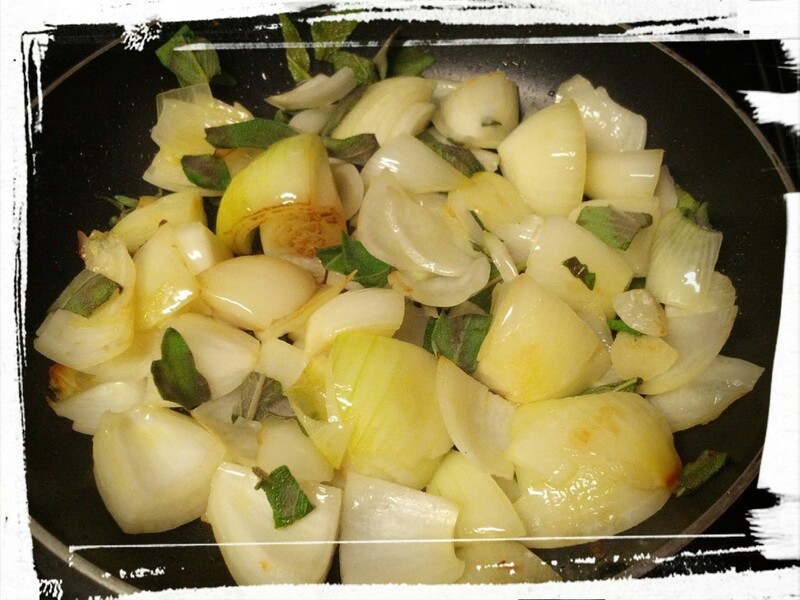 This entry was posted in Memories of Meals Past, Uncategorized, Vegetarian Side Dishes on November 14, 2014 by Margaret.